Master and Commander is the first of Patrick O’Brian’s now famous Aubrey-Maturin novels, regarded by many as the greatest series of historical novels ever written. It establishes the friendship between Captain Jack Aubrey RN and Stephen Maturin, who becomes his secretive ship’s surgeon and an intelligence agent. It displays the qualities which have put O’Brian far ahead of any of his competitors: his depiction of the detail of life aboard an early 19th century man-of-war, of weapons, food, conversation and ambience, of the landscape and of the sea. O’Brian’s portrayal of each of these is faultless and the sense of period throughout is acute. His power of characterisation is above all masterly. Ric Jerrom reads this classic sea story from Patrick O’Brien. This is the first of a fantastic series of book. I have read them all. I must admit that the first time I read Master and commander I was not drawn straight into it. I found it to be a bit of a slow burn and O’Brian does not leave out any detail of life on board ship so there is a sea of very technical language that it is very easy to sink in. I persevered however and was soon lost in the world of the 19th century royal navy and the many adventures of Captain Jack Aubrey and his friend and Master Spy Stephen Maturin. The day I finished the last book was a sad day indeed but what a ride! At the moment this and just one other of the books seem to be available in their unabridged form. I Have asked and beg any fans of the novel to join me in asking Audible to try and get the whole series available in the unabridged form on this side of the Atlantic where jack and Stephan would want them. I was so pleased, when I found, that I could get this unabridged version of Master and Commander. The story is full of humor and life. Ric Jerroms narration is spot on. I would love to be able to buy the rest of the series in an unabridged version. Jack! You have debauched my Sloth! What made the experience of listening to Master and Commander the most enjoyable? The Aubrey/Maturin series are classics. They are quite simply the best historical novels ever written. They open a window into a world two hundred years gone - the world of the Royal Navy during the French Revolutionary and Napoleonic Wars. This was a time of blood and thunder, of maritime siege, a war of long, patient endurance against a tenacious and powerful enemy. The story follows the adventures of two heroes in this war: Captain 'Lucky' Jack Aubrey and the physician, naturalist, and secret agent Stephen Maturin. And what adventures! O'Brian's books are filled with espionage, warfare and the stinking reek of gunpowder. They are also full of humanity: perverse and humorous, dear and terrible, wonderfully alive. The narration is excellent - Ric Jerrom is a revelation. He gives a supremely able and assured performance - certainly on a par with Audible's other star narrators (for instance Rupert Degas and Toby Longworth). Start with book one today! There is not a moment to be lost! Which it was a relief! 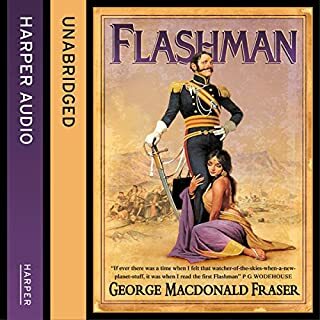 As a massive fan of this justly famous and much loved series I was nervous of possible mortal injury to my own internal narrator from some badly formed and merely commercial attempt at an audiobook. So I am pleased to confirm that it is Beautifully read with the characters voiced delightfully. I hesitated for months before taking a chance on this. If you are a big Aubrey and Maturin fan then buy it now. Prodigious fine book, with dashing good narration. 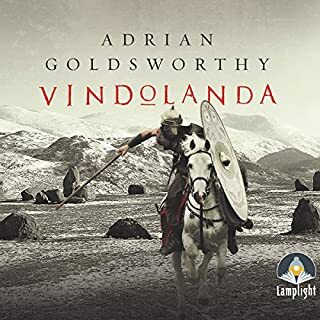 I have read all the novels but enjoyed this audiobook tremendously, O'.Brian creates is a world in which one cannot help but be utterly immersed. The dialogue, especially that between Aubrey and Maturin, is sheer joy. More unabridged Patrick O'Brien please. Unlike another reviewer, I have been waiting for the unabridged versions of the O'Brian novels to appear on Audible ever since I joined. The whole series was available on cassette but sadly I never recorded them, and I have found the abridged versions unsatisfying. I consider them to be the best naval historical fiction - loosely based on a real naval captain - ever written, and can only hope that more will appear in due course. This book is a must for anyone interested in the sea or tales of history adventure. The attention to outstanding so much so it is hard to imagine that the book was written 170 years after the events. Yes - they are all extremely well narrated, his ability to change characters seamless is brilliant he has brought this story alive! This book indeed this series warrants savouring over days or weeks. The attention to detail sometimes requires full attention which it would be hard to do in one sitting. Please listen to the crew!!! Loved these books for years, such detail, such knowledge, such style, such a mordant wit and most of all such fabulous and detailed yarns. I also enjoyed the film which was (loosely) based on this and a later novel "The Far Side of the World". 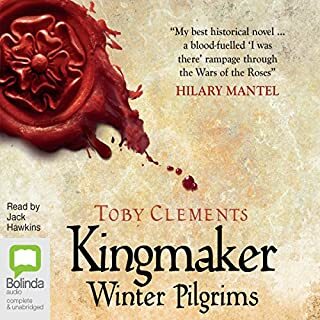 Comimg to the Audible version I was a little nervous: the main characters have their own voices in my imagination after all these years, but this reading did not let me down. In fact some of the more obscure nautical passages (and for the beginner these can be a tad daunting) became clearer through Mr. Jerrom's excellent reading. 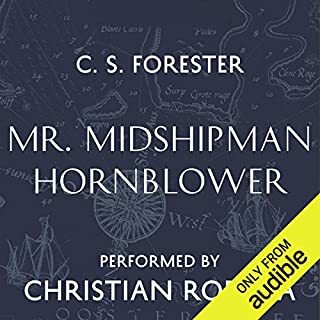 The only disappointment is that I couldn't go straight on to Post Captain, because Audible have only produced one other unabridged novel in the series. Come on Audible, we may be a smallish crew of admirers, but we are loyal to Honest Jack and we will happily follow him and the admirable Doctor for another 19 of these excellent tales. I loved the movie with jack russel (hope i wrote the name right). When i saw there is a book of the title i had to check it. 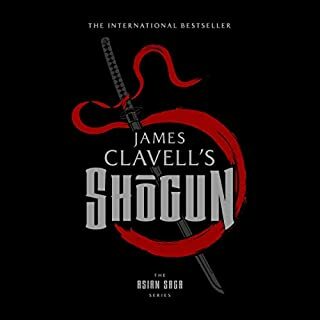 new to buying audio books online, but this boo is very interesting and the performence is lively. very recommended. Jack and Stephen differ in so many ways! Jack, an officer in His Majesty’s navy, is tall, robust, tanned, good-natured, and blond-maned, while Stephen, an out-of-work civilian physician-biologist is small, slender, pale, melancholic, and be-wigged (with a weird hair-piece made of wire). Furthermore, Jack tends to speak his mind, often unintentionally offending his interlocutors, is bad at languages (as when he comically confuses “putain” with “patois”), is hot-tempered (which gets him into trouble with authority figures), while the highly educated and intelligent Stephen is more careful in his speech, more philosophical, and is fluent in Catalan and speaks Spanish and French as well. Nevertheless, the two men are roughly the same age (between twenty and thirty), share a love of music (Jack playing the violin, Stephen the cello), and are naturally drawn to one another as boon companions. One of the great pleasures of the novel is beholding their friendship unfold. And of course there are plenty of nautical details in the novel, about the different ships in the age of sail, and of the different sails, masts, guns, crews, officers, punishments, techniques, procedures, protocols, strategies, food and drink, toilets, sleeping arrangements, and so on involved. Some of them remain opaque to land-lubber me, but many of them become more or less clear thanks to O’Brien’s device of inserting Stephen, a man with “no experience in naval matters,” into Jack’s world, so that he may ask questions and make comments on our behalf, so to speak, as when early in the novel he’s given a tour of the Sophie by a midshipman. Anyway, the nautical details never get in the way of the story, which is full of psychological and physical excitement, humor, relish, and suspense. Ric Jerrom reads the novel with clarity, feeling, and wit, modifying his voice effectively for the different seamen, whether common or elite, English or foreign, old or young, drunk or sober, pleasant or nasty, and so on. He brings the book vividly to life. Fans of the Hornblower or Lewrie books should enjoy Master and Commander, as should anyone who likes historical novels featuring compelling characters and authentic settings and exciting action. The Aubrey-Maturin series is one of my favourite series of historical fiction. The historical backgrounds are well-researched and accurate, the plots intriguing, the writing superb. What's more, the stories are told with some humour, and with real love for the main characters which are thouroughly human and likeable despite (or because of) their faults. And there's plenty of naval warfare action, plus some science thrown in too. The narrator of this first book in the series is excellent, he strikes exactly the right tone of voice. I can't wait for the whole series to become available (*unabridged*!). Now I know what I've been missing. Good dramatization of historical events and age of sail procedures and customs. I thought the narrator did a credible job of imparting the style of the speech and manner of the people, without straying into parody, at least to my uneducated ears. I quickly got to caring about the characters and what happened to them. I would recommend it to anyone who likes good stories with detail which is part of the story, rather than the story merely being there as an excuse for the recitation of the details. I'll get around to the next volume before too long, I'm sure. What did you love best about Master and Commander? What other book might you compare Master and Commander to and why? The Hornblower series because it is the same genre however this work emphasises the social relationships and norms of the time. Would you listen to another book narrated by Ric Jerrom? Would you consider the audio edition of Master and Commander to be better than the print version? Stephen Maturin, he is the man of the enlightenment. He has stood behind ideals and became disillusioned, but he is still able to feel childlike joy. Who was the most memorable character of Master and Commander and why? It was the duo of Aubrey/Maturin (big surprise there) as the chemistry is simply right. This book is heavy in nautical terms/slang. If you don't like Age of Sail stories, consider to decrease the story rating by one or two stars. If you want to read your first Age of Sail story, this can get you hooked, the print book did it for me. Getting into the nautical life in the 1800's. There was much I haven't understood, but that's OK, I caught as much as I missed. The slow pace of much life under sail surprised me, but it makes sense when they were so reliant upon the wind. Stephen - sensible, observant, reflective. A foil for the exuberant, shallow and somewhat oblivious Captain. Good book. From listening to previews, I am not sure the narrators of later books of the series have done as a good a job as this one. You truly get the gauge of naval life and the detail of the nautical battles are breath taking! 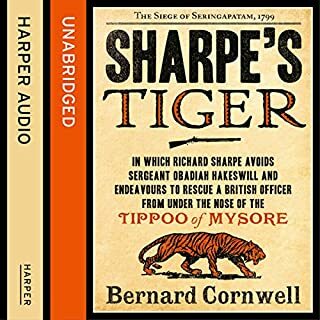 Much like how Bernard Cornwell's Sharpe series captured the essence of British infantry life during the Napoleonic era, Patrick O'Brian's Aubrey-Maturin series (read by Ric Jerrom) creates for the listener a similarly detailed & compelling narrative of British nautical warfare throughout this period. 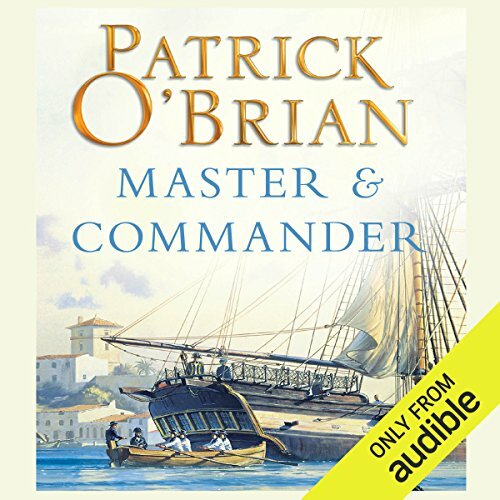 Where does Master and Commander rank among all the audiobooks you’ve listened to so far? What aspect of Ric Jerrom’s performance would you have changed?